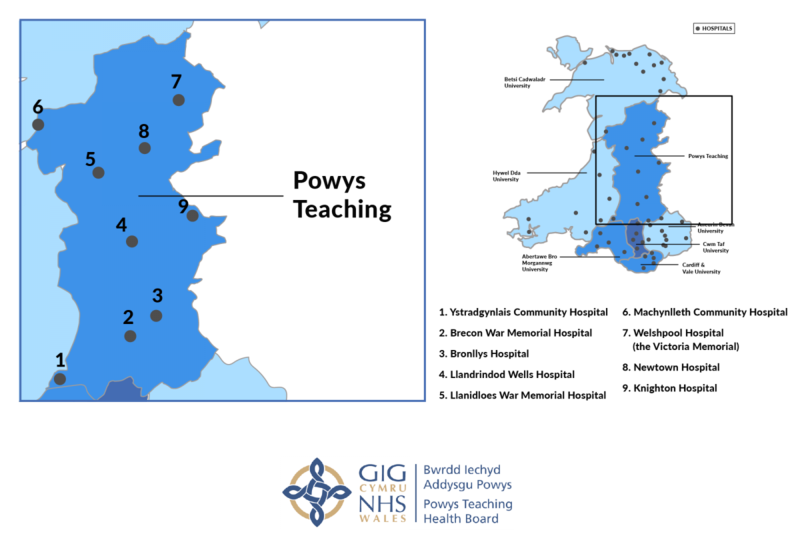 Powys Teaching Health Board provides services for a relatively small number of around 133,00 people, but over a geographical area covering a quarter of Wales, across Powys and mid Wales. With no district general hospital, it works in partnership with other health boards in Wales and England, and provides as many services as possible locally, via community hospitals, GPs, primary care services and community services. This community hospital is half a mile from Brecon town centre and has a range of services for children and adults. These include medical and palliative care, rehabilitation, and EMI unit and day hospital, a children’s centre with community paediatric services, community dentistry, many therapies, a Child and Adolescent Mental Health Service (CAMHS), gynaecology, a stroke unit and many more. It has a minor injuries unit and a midwife-led birth centre with a birthing pool. Specialisms: Brecon War Memorial Hospital runs a number of endoscopy sessions, including gastroscopy, colonoscopy, cystoscopy and colposcopy. It also houses Bowel Screening Wales and holds pre-anaesthetic and biometric sessions. Eight miles from Brecon, the community hospital at Bronllys has one general ward, which has 15 beds and is consultant and GP led. These are used flexibly, with GPs tending to admit patients from the community and consultants from the district general hospitals, mainly those at Hereford and Abergavenny. Patients are admitted for conditions including medical, post operative rehabilitation, Parkinson’s and palliative care. Bronllys also has a mental health ward, a pain and fatigue management centre and a range of therapies. Specialisms: Powys Public Health Team is based at Bronllys. Knighton is a small community hospital with services including community psychiatric nurses, speech and language therapies, dietetics, palliative care, child psychology and old age psychiatry services, AAA screening, cardiac nurses and a lymphedema clinic. Health visitors and a ‘Bumps and Babes’ service is based there, as well as a very small birthing unit. A residential home called Cottage View is also on the site. Close to Llandrindod town centre and originally the county war memorial hospital, Llandrindod Wells Hospital has generic, elderly mental health and day surgery wards, a birthing centre and x-ray facilities. It provides outpatient services from Monday to Friday in the areas of orthopaedics, orthodontic, general surgery, oral surgery, visual fields, occuloplasty, dermatology, gynaecology, paediatrics, rheumatology, urology and many more, as well as clinics for fall assessment, retinopathy, speech and language, paediatric physiotherapy and newborn hearing. Specialisms: A range of operative procedures are carried out at Llandrindod Wells, including orthopaedic, gynaecology, ophthalmology, ENT, endoscopy, urology and general surgery. Llanidloes War Memorial Hospital has one 16-bed ward for medical and rehabilitation patients, supported by community GPs and a multidisciplinary team incorporating a range of therapies, a Parkinson’s specialist nurse, a respiratory nurse, an Incontinence nurse, a mental health team and social workers. It also has an outpatients department supporting outreach clinics from across the health board, including general surgery, gynaecology, general medicine, paediatrics, orthopaedics, ophthalmology and medical oncology, and a birthing centre. Specialisms: The outpatients department has a number of specialist nurse clinics. Specialisms: Machynlleth supports specialist nurse clinics including respiratory, adult and paediatric dietetics, Parkinson’s and continence. One of Powys’ larger centres, Newtown Hospital has stroke rehabilitation beds and a rehabilitation unit with therapies including physiotherapy, occupational therapy and speech and language, as well as dietetics, nursing and rehabilitation assistants and doctors. Regular outpatient clinics include general medical, general surgery, gynaecology, ophthalmology, pain management and urology, while Newtown also has an x-ray department and a midwife-led birth centre. A minor injuries unit is based at the GP surgery on Park Street. Specialisms: Newtown Hospital has the Hafan Ward, which runs Hospice at Home services, complementary therapies, cancer support and dementia, diabetes and lymphoedema clinics. Fan Gorau is an assessment unit for older people with mental health issues. The Victoria Memorial Hospital is another of Powys’ larger hospitals, with a 21-bed ward for medical and rehabilitation patients supported by a multi-disciplinary team. Patients can also be seen as a day case. There is a nurse-led minor injuries unit open 24 hours, seven days a week, which is supported at certain times by GPs from Welshpool and Llanfair Caereinon practices. The outpatients department supports outreach clinics from Shrewsbury, Telford and Wrexham Maelor hospitals, including gynaecology, ophthalmology, ENT, audiology, respiratory and paediatrics, while other external clinics include dermatology, the British Pregnancy Advisory Service and abdominal aortic assessment screening. A visual fields service is being developed, and there is also a midwife-led birth centre and an x-ray department, which is supported by Wrexham Maelor. Specialisms: Welshpool has a renal unit, open three days per week and supporting patients who require dialysis as an outpatient. Ystradgynlais is another small community hospital on the southern fringes of Powys, with a minor injuries unit staffed Monday to Friday. Its services include outpatients, mental health, midwifery, specialist and district nurses, health visitors and school nurses and a range of third sector organisations.